Welcome to the Yankee Candle Fall Festival Giveaway! Real Mom Reviews has teamed with an awesome group of bloggers to bring one super lucky reader three large Yankee Candle Jars in fall scents. The traditional design of Yankee Canndle signature jar candles reflect a warm, relaxed sense of style that’s always at home. Convenient and easy to use, the large Housewarmer Jar Candles provides 110 to 150 hours of true fragrance enjoyment! The seasonal candles one reader will win help celebrate the best of fall with fragrances inspired by the beauty of nature and the bounty of harvest. Apple Cider is a welcoming aroma of hot cider spiced with cinnamon, cloves and nutmeg! Spiced Pumpkin will quickly fill your home with the smell of fresh pumpkins baked in simmering spices of clove, nutmeg, and cinnamon, and sweetened with brown sugar. Autumn Leaves provides a vibrant scent medley of birch and maple leaves with pomegranate, juniper berry, and orange blossom that will leave your whole house smelling like fall! One lucky reader will win them all! Giveaway is open to US and Canada. Entering is simple, simply read over the giveaway rules and then enter using the Rafflecopter form below! Thank you for stopping at my spot on the November Surprise Tour and Giveaway. This Online Book Tour is brought to you by Reading Addiction Blog Tours. 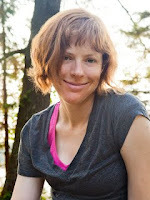 I will provide you with a synopsis of the book, review on the book, Laurel Osterkamp, a small bio from her. Visit the other blogs on this Book Tour to learn more about this book. Laurel Osterkamp was a comedy writer in Minneapolis before she began writing novels. which is inspired by her recent jury duty. November Surprise was a quick read but held my interest to the end. I really liked that the book started with Lucy being 17 and in high school in 1988 and so interested in the presidential elections. She was very smart about the men running for president for someone so young. I like that the story went through to the last elections. Going through every four years brought back many memories for me, it was like going back in time thinking about my life and what I was doing at the time. I liked reading about Lucy’s struggles but also the friendships that held on throughout her life. I think that anyone who reads this would like the twist and turns Lucy life takes. I think you will find the story light and entertaining. Pick up a copy today! Or enter below to win an e-copy of November Surprise. 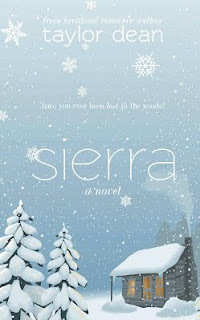 Thank you for stopping at my spot on the Sierra Virtual Book Tour and Giveaway. This Online Book Tour is brought to you by Reading Addiction Blog Tours. I will provide you with a synopsis of the book, review on the book, Taylor Dean, a small bio from her. Visit the other blogs on this Book Tour to learn more about this book. I loved this book, it was one I hated to put down. I also went through many emotions through out the book. Alyssa and her family Sam her husband and Clay her two year old son were returning from a wonderful vacation at Lake Tahoe when something unthinkable happened. Two mountain men kidnapped them and made them drive into the mountains. When they finally stopped the two man killed her husband and son, and then forced Alyssa to go with them. This part of the story was so brutal and showed what strong spirit that Alyssa had she continued on to push on escaping a couple times only to be caught again by Pa and Adam. They kept her roped up at night and dragged her by a lease during the day. She was so tired. When trying to find their home they stumbled upon a cabin and a man living out in the wilderness by himself. Alex is a kind man and wants to help Alyssa, he will not let her leave with Pa and Adam. I do not want to spoil the story so will go into no more detail, but this is a wonderful story about love and second chances. Its about continuing when you thing there is no hope and nothing to live for. It is about finding happiness even through the bleakest moments. I can’t wait to read more books by Taylor Dean, she is a great story teller. Please visit some of the other stops on the Tour. Thank you for stopping by my blog – I love candles and here is a new and fun candle company, with a great surprise in each one. Maybe you will be the lucky winner of another candle or a piece of jewelry. Enter to win there are 10 winners!!!! Check out our fabulous co-hosts, The Frugal Free Gal , Sister’s Saving Cents, Pink Ninja Blogger, Simply Shawn & Jenn, and Moms Vacation Spots. Wickedly Scented Candles brings you all natural soy candles with a twist. There’s a prize in each candle. They have mixed it up a bit too! Rather than sticking to a particular piece of jewelry in each candles, they offer a variety of prizes. Not just different types of jewelry either, codes for FREE Candles, and other amazing prizes. I am participating in the FREE Yankee Candle giveaway event hosted by Real Mom Reviews. One super lucky reader will win three large jar fall fragrance Yankee Candles! Cost: Free with announcement post or 3.00 with out. Giveaway Open to: US and Canada. The event dates: September 28th-October 19th. Free Link Option: Facebook Optional Paid Link Options: $2.00 for Twitter or Pinterest To sign up for this event click here! T.M. Souders was born in Johnstown, Pennsylvania and grew up in the suburbs outside of Pittsburgh. She graduated in 2004, from Youngstown State University, with a degree in Psychology and minor in Women’s Studies. 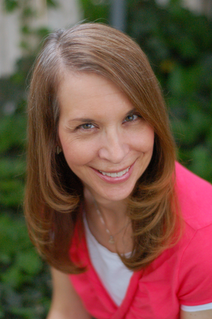 She is the author of bestselling women’s fiction novel,Waiting on Hope, as well as the novelette Dashing Through The Snow and the young adult/crossover novel, Freedom Road, due for release on Sept. 18th. In her spare time when she is not writing, she is an active volunteer for The World Literary Cafe, a site dedicated to authors and readers. She currently lives in rural Ohio with her husband and children. Just when Sam has given up, two unexpected people enter her life, giving her the confidence she needs and forcing her to evaluate all she’s ever known. Battling her father’s plans for her future, band mates using her for personal gain, and a permanent injury, the odds are stacked against her. With auditions approaching and time running out, Sam must relearn to play the guitar, or be destined to give up her dreams forever. I loved this book from the first paragraph I read, once I started reading I could not put it down. 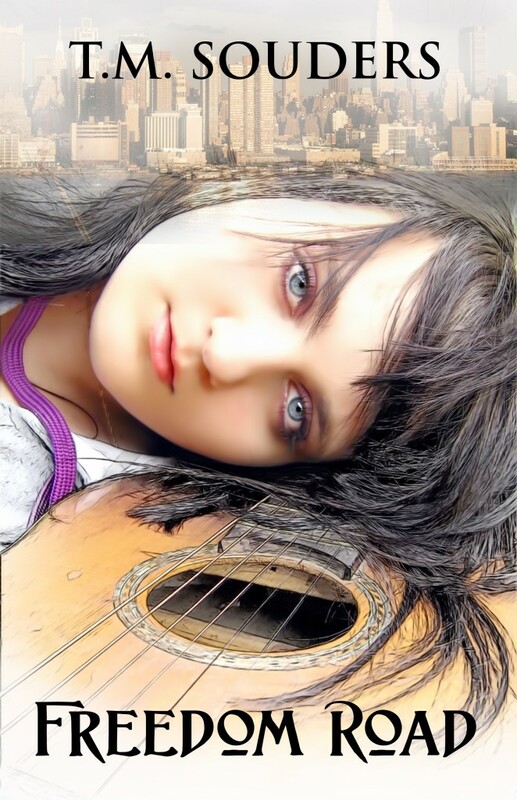 Sam (Samantha) Becker is 18 is the main character in this story. Her mother is an alcoholic and is drunk most days. Her father is a domineering workaholic and is either at work or with the other woman. Her father has Sam’s future all planned out for her – to take over his job at the bank. Only that is not what Sam wants when she was eight she was given a guitar; that she learned to play and played very well. 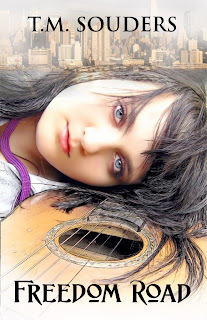 Her dream was to study classical guitar at Julliard. One night something awful happens to Sam, her father accidentally cuts off her ring finger, her fret finger. For most of us this would be the end of our dream, but Sam is determined. At first she was very depressed but with the support of a twelve year old neighbor Tad, and a college student Laird. Sam has hope. I don’t want to spoil the rest of the story for you but I will let you know the plot has some surprising twist in it and it will hold your attention. I cried and I cheered at Sam’s disappointments and her triumphs through out the story. I know you will love this as much as I did. Enter to win your own e-copy of Freedom Road. This contest is International for any 13+. Contest Closes on September 27th. Thank you for stopping by AToMR Tours promotional event of the Young Adult novel Dante’s Girl by Courtney Cole. I will provide you with a book description and a giveaway. Winner’s choice of a gifted ecopy (Kindle or Nook) of Princess or Soul Kissed. Open International. If winner lives within US/Canada, they will also receive a signed 4×6 glossy of Dante’s Girl. Contest runs September 19 -26. E-book will be sent out after October 5, 2012. Contest is over – Winner is Rhonda Laney!! Below is a great blogger opportunity. Join us in helping spread the word about a new company and gain new blog followers. Jenn’s Blah Blah Blog and soon to launch Pink Ninja Media, bring you another FREE Blogger Opportunity! The sponsor of this wonderful event will be Wickedly Scented Candle Company! 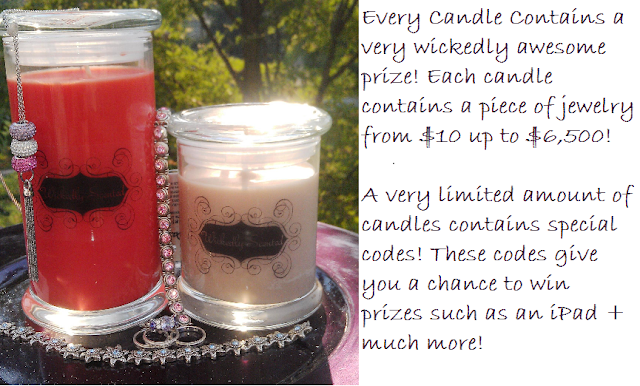 Wickedly Scented Candles Company is offer our readers a chance to win an awesome prize! 10 Candles, means 10 Winners! Wickedly Scented Candle Company offers wicked scents with a super prize valued at $10 up to $6,500! Don’t you think your reader will love a chance at this fabulous prize! So what’s in the candles, I know you’re just waiting to find out more! When you burn their candles you’ll find different prizes such as: jewelry, or a special code according to the size of the candle. Monthly special candles will also have an extra prize that you’re going to have a chance at willing according to the size of the candle. They offer different sizes of candles as well! So what’s in it for you? Join us and help, Jenn’s Blah Blah Blog and Pink Ninja Media introduce Wickedly Scented Candle Company to our readers the right way! With a fabulous giveaway, offering 10 winners and plenty of chances to win. Where do I sign up? It’s easy, to sign up CLICK HERE!